Lord Mayor Erias Lukwago and the suspended legislators at the High Court in Kampala today. File photo. As Parliament is sitting for the third time to debate the Presidential age limit, the seven suspended legislators have this morning, Wednesday, dragged Speaker Rebecca Kadaga to the High Court, requesting for a mandamus order. A mandamus order is a command to an inferior court or ordering a person to perform a public or statutory duty. The suspended MPs including Gerald Karuhanga, Ibrahim Nganda, Mubarak Munyagwa, Moses Kasibante and Allan Ssewanyana, said Kadaga in suspending them, she totally abused the rules of procedure governing the House. 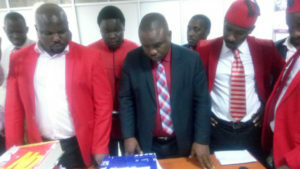 Through their lawyer Lord Mayor Erias Lukwago, the suspended MPs said Kadaga acted as the law herself and her actions wouldn’t go legally unchallenged. The legislators also argue that the Speaker disregarded the provision of Article 28 and 42 of the Constitution by unlawfully mentioning their names. “Why did she suspend me? I am one of the most disciplined MPs in that House. I tried as much as I could to exercise restraint….. I just can’t understand why I was suspended,” Munyagwa said. The legislators were allegedly suspended for causing disorder in the House.